I had my periodic surveillance visit to Dana-Farber today. As you may recall I will see a doctor there every two months for the first two years following treatment, to make a visual inspection of my throat and make sure the cancer is not recurring. I trade off doctors every visit, so today's visit was with Doctor Rad. We really like both of my oncologists but Doctor Rad is the warmer of the two. I sometimes envision socializing with her - inviting her family to a barbecue at our house or something. One spends so much time with one's doctors during treatment - and such vulnerable time - that they feel like family by the time you're finished. If there can be a cool thing about cancer, the cool thing about tongue cancer is that to look for recurrence doctors can just use their eyes directly. They don't have to interpret images made by a computer after some system has shot energy beams through tissue and bone. It's direct and instant and less error prone. To look at my tumor site they spray an anesthetic mist into my nostrils and then insert a thin, flexible scope in my nose and feed it down into my throat. Normally the scope doesn't hurt at all; it's just slightly uncomfortable. At the December visit my nasal passages were inflamed and swollen a little and it hurt more, but today was normal and almost painless. The photo above shows me with the scope in my throat. This photo shows what the doctor sees. To orient you, you are looking down my throat from the back of my mouth. The bottom of the photo is the base of my tongue. The bright inverted arch is my epiglottis and at the end of the tunnel you can see my vocal cords. During this image I am saying "eeeeeee", which makes the throat open and round so you can see well. It also happens to stretch the vocal cords tight. 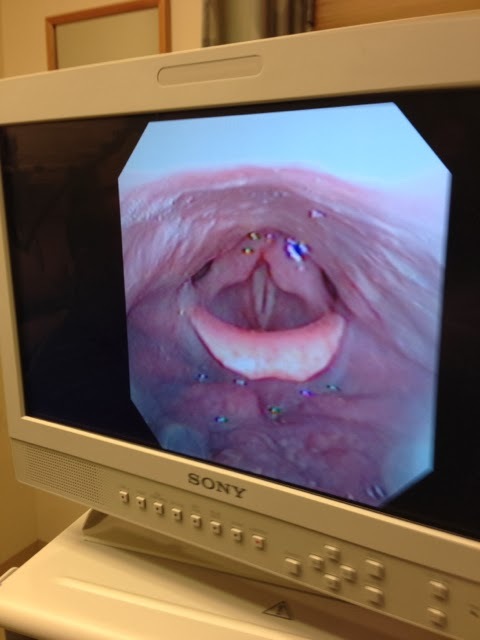 The scope is a little off center but you can see the groove on the "floor" that runs down the middle of my tongue. 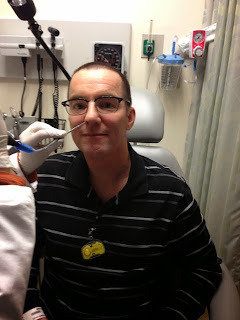 It didn't occur to us to take photos during my initial consultation at Dana-Farber on June 4. At that time the groove appeared much deeper because the tumor consisted of tongue tissue that was much puffier and "higher" on both sides of the groove. So high that it was half blocking my throat. Now my tongue looks normal. Officially I am classified as "No Evidence of Disease" ("NED"). On Friday it will be six months since the end of treatment. Inspirational journey of cancer treatment. Your doctor is really supportive to you. Hope you will be fine soon. Throat problem occurs due to chemotherapy treatment.